barrettSF is launching its first marketing campaign for client Cost Plus World Market. The work will run through the beginning of September. 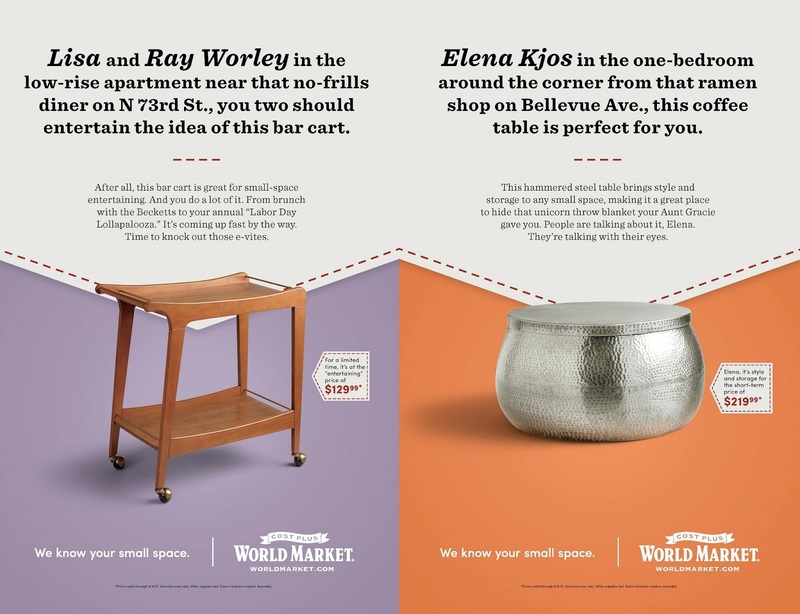 “Small Spaces” is a multimedia campaign that utilizes print, out-of-home including guerilla tactics, digital video, digital display, interactive mobile units, in-store collateral and direct mail to showcase Cost Plus World Market’s stylish, affordable, multipurpose furniture to a target audience ranging from urban dwellers in their 20s moving into their first apartments to empty nesters in their mid-50s who are downsizing. In the videos, TV design expert and host of the popular series “Rehab Addict”, Nicole Curtis, helps people transform their small space with Cost Plus World Market furniture. 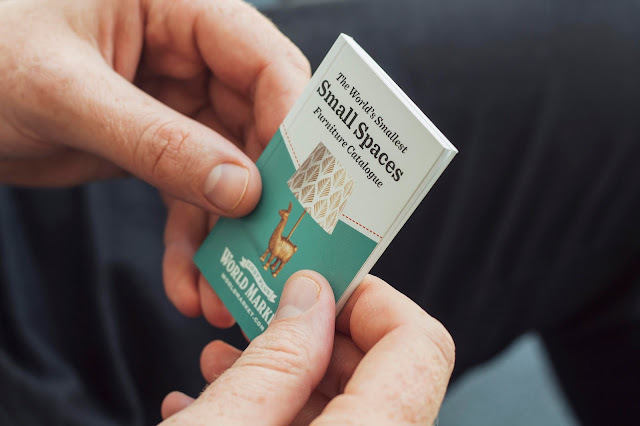 In one, a woman rolls out a carpet on her floor and Curtis pops out—no explanation given—to reveal how a lidded coffee table can double as small space storage. 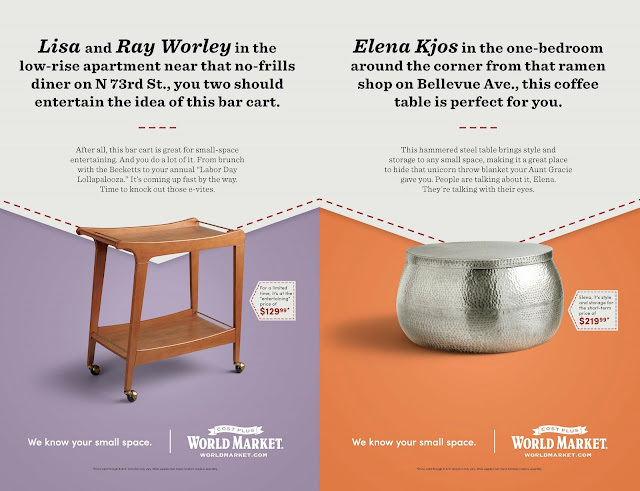 Another video has her wheeling through rooms on a rolling bar cart, which can be tucked into a corner when the room needs to be converted into a dance floor. "Most retailers see small living spaces as problems that need to be solved," said Todd Eisner, creative director at barrettSF. 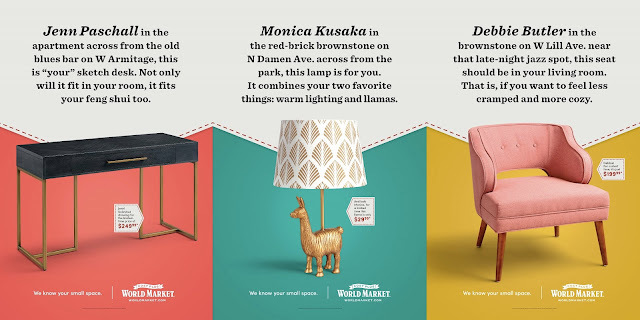 "We see them as an opportunity to show off your individuality by curating and creating a unique home. So, we decided to speak, quite literally, to individuals." 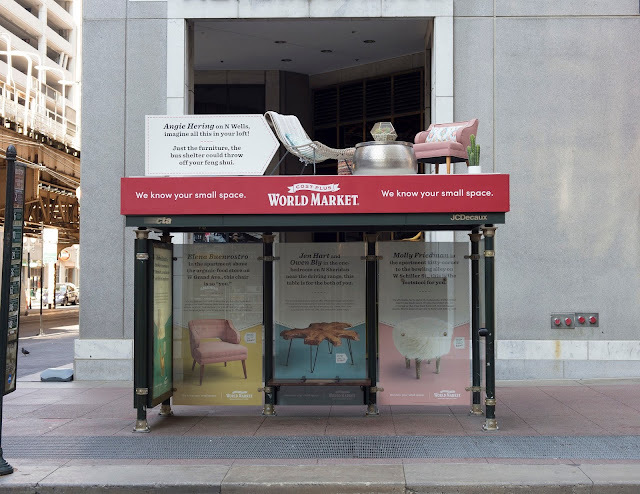 To show how small can have a big impact, the campaign includes a number of unique executions, from a Chicago bus shelter with a fully-furnished living room on its roof, to a 40-page catalogue that measures twoinches in height.